This time of year, sweets and treats are everywhere, especially if you work in an office. Parties and mixers are happening every weekend, which means the drinks are flowing. The end of the year is definitely the hardest time to maintain a healthy lifestyle. A little of this and a little of that adds up and before you know it you’ve put on five pounds that seem to have come out of nowhere! By the time you ring in the new year, your bad habits have gotten the best of you and you’re starting to feel tired, sluggish and just not the best version of yourself that you worked so hard all year long to maintain. The good news is BioAge MD has your post-holiday blues covered. You can prepare now, so you’re not struggling when it comes time to working towards your new year’s resolution. BioAge MD offers services like Ideal Protein or the HCG diet that is fast acting and utilizes HCG injections specifically designed to curb appetite and enhance fat burning capabilities that accompany a low-calorie diet. 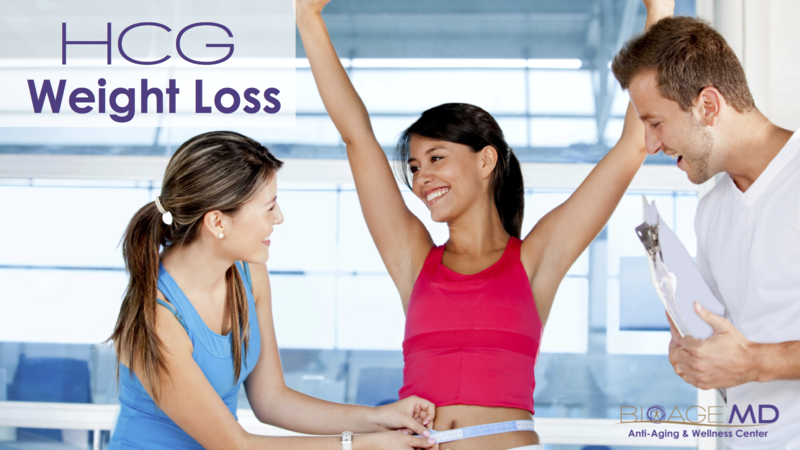 Participants also receive a weekly fat-burning injection with their weigh-in! BioAge MD also offers the BIO Slim Shot – the ultimate fat trimming injection that also helps energy levels if you’re just not feeling your usual energetic self. If you just need a little facial pick me up, try out our skin brightening IV therapy to make sure you start the new year with youthful, radiant skin. Whatever it is you’re looking for, BioAge MD can help you reach your ideal image. The most important thing is not to wait until you’re feeling down about yourself. Contact us today and set up your consultation in West Palm Beach! Call (561) 223-2707 or click here to schedule an appointment. Stress is everywhere. It can be good and it can be bad. It can even be debilitating. We always talk about the holidays being a merry time of joy, but the truth is it can be stressful too. When people get stressed the first thing that usually goes out the window is their routine, but this is one of the things that could actually help the situation. 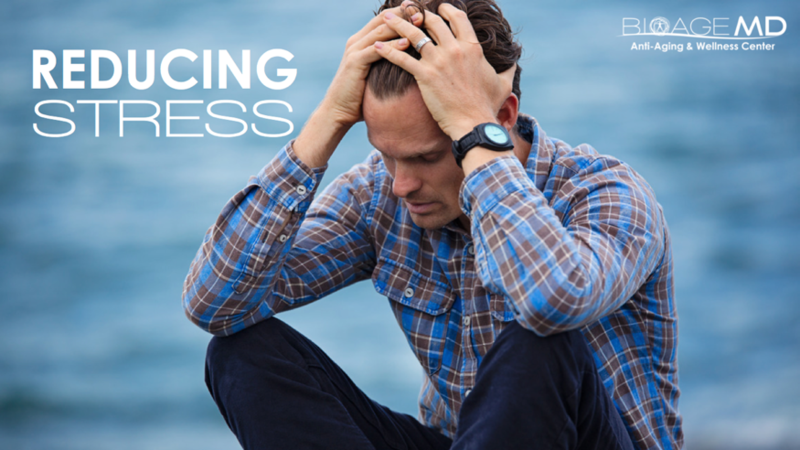 Here are some more ways to reduce stress. Sleep is key during times of high peak stress. A good night’s sleep can help reduce the effects of stress. Maintaining a balanced diet is also imperative at managing stress. Did you know your diet and nutrition choices actually affect your stress levels? Certain foods increase levels of hormones in the body that fight stress naturally, while other foods lower the level of hormones that trigger stress altogether. Overall vitamin and supplement consumption, however you choose to get it, is also key to managing stress. BioAge MD actually offers IV vitamin therapy that delivers proper doses of vitamins and nutrients via an IV. This type of vitamin therapy is great for people on-the-go who can forget to take a physical vitamin due to the hustle and bustle of the day. Nutrients are also better absorbed via IV than by our GI tract. Nutrients like Vitamin C can really affect the way you feel. Many people think they’re getting their proper amount of vitamin C, and other vitamins, by eating fruits like oranges. Research has shown, however, that only a small percentage of vitamin C is actually absorbed through food. Finally, a detox after the stresses have passed and played out might be what you need. Whether it’s for weight loss, or just to feel cleansed inside and out, detoxes have powerful effects on the mind and body. If it is just weight loss you’re after, you may be a good candidate for Ideal Protein or Bio HCG. BioAge MD’s fast-acting program that utilizes HCG injections to help curb your appetite and enhance the body’s fat burning capabilities. Whatever it is you’re looking for, BioAge MD in West Palm Beach has probably got you covered. Don’t wait until you’re feeling overwhelmed, tired and out of time. Call today and schedule your free consultation: (561) 223-2707. This holiday season, give the gift of Ozone Sauna Therapy. 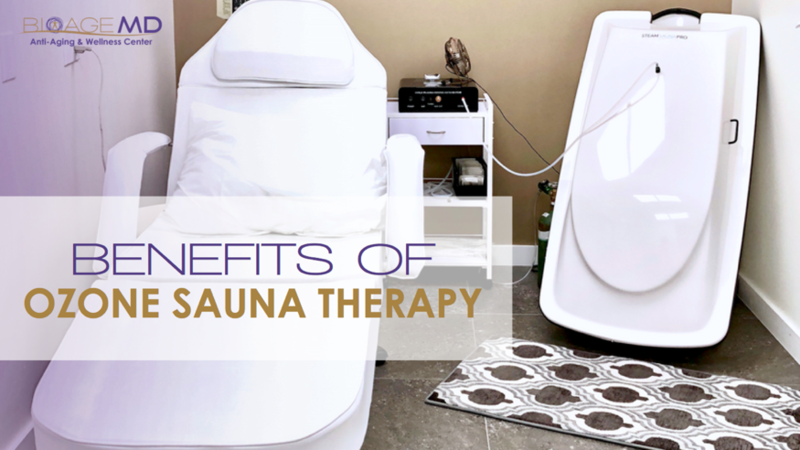 This therapeutic technology uses a special steam sauna cabinet of “activated oxygen”. Ozone Sauna Therapy acts directly as a catalyst that causes the body to begin to dump toxic waste accumulated, and held, inside the body. The moist heat of the steam from the sauna is absorbed trans-dermally through the skin’s pores to detoxify and oxygenate the body. Toxins stored inside the body are purged through the body’s sweat, and as the body sweats, organic peroxides are created in the oils of the body being excreted by the skin. The end result leaves you feeling relaxed, energized, and completely detoxed from the inside out. As with other methods of ozone delivery, Ozone Sauna Therapy can also offer positive results for conditions like fibromyalgia, arthritis, Lyme disease, and even shingles. Typically, Ozone Sauna Therapy sessions last for approximately 30 minutes and the body will experience temperatures between 103 and 110 degrees Fahrenheit. Prior to any ozone sauna therapy session, it is extremely important to eat a healthy meal and drink lots of water. Antioxidants intake should be avoided one hour before and about two hours after Ozone Sauna Therapy. We are offering package pricing for Ozone Sauna Therapy and have gift certificates available. For more information on ozone sauna therapy, or to book your treatment today, click here! Did you know that more than half of all Americans take one or more dietary supplements? Many of us have taken vitamins for as long as we can remember. We started with chewable vitamins (raise your hand if you loved Flintstones Vitamins) and eventually we progressed to adult multivitamins. Maybe you even take vitamins for more specific applications: vitamin C during cold & flu season, vitamin E for added antioxidant protection, vitamin D during winter when the days are shorter. 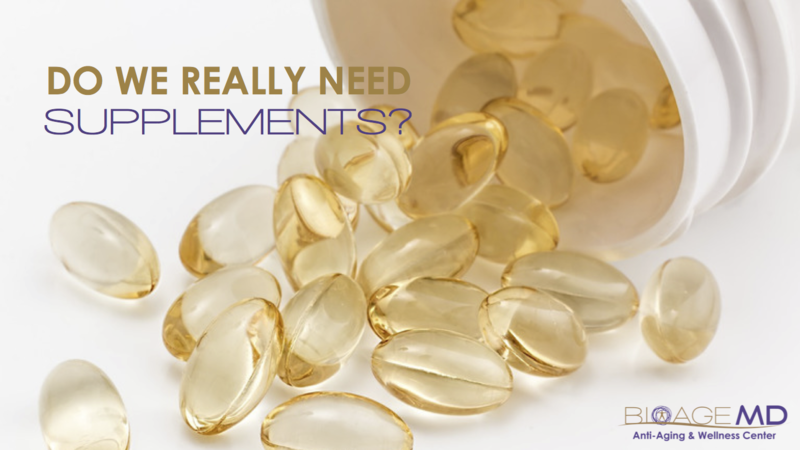 Beyond vitamins, many of us take other common supplements like minerals and botanicals. But do we actually need these added supplements in the first place? Living in a high speed society where we eat on-the-go, consume too much sugar, skip meals, don’t find time to exercise regularly, drink too much caffeine, experience stress, don’t sleep enough, and don’t drink enough water, the answer is probably “yes, you need supplements to support your health.” The biggest benefit of supplements is that they fill in the gaps where you are lacking nutritional support. Research has shown that many supplements can indeed enhance your health in a variety of ways, and the risks are very limited. They can help us pick up where our healthy habits left off, providing our bodies with the extra boost they need to ward off disease, reduce inflammation, protect our DNA, improve our mood, boost our immune system, and contribute to brain health. Just keep in mind that supplements are not a panacea. They can not replace healthy habits such as wholesome diet, sleep, exercise and stress relief. Can’t I just eat a healthy diet to get the nutrition my body needs? A healthy diet and lifestyle is always number one. Minerals and nutrients are involved in every action in our body, be it thyroid, brain, etc. But unfortunately, it’s difficult to get all the nutrients you need from food alone. For the most part, the food we consume today lacks the nutritional content our bodies need to perform at optimal levels. This is due to a variety of factors: depleted soils, mass farming, picking food too early, spraying food with chemicals, transporting food long distances after it’s picked (nutritional value depletes dramatically every day after picking)…the list goes on. This is where high-quality supplements come into play. Supplements give our body some extra firepower, providing the body with added minerals, nutrients, vitamins, antioxidant support, and more. And if you take pharmaceutical grade supplements, they provide support at the cellular level and at the end of the day, our health begins at the cellular level. Hint: definitely go for the pharmaceutical grade supplements…which leads us to our next point. What’s the difference between regular and pharmaceutical grade supplements? The United States does not regulate supplements. If you don’t buy supplements from a pharmaceutical grade supplier, you won’t know what you’re actually getting. Pharmaceutical grade ingredients, on the other hand, are over 99% pure and contain no binders, fillers, excipients (substances used to dilute drugs), dyes or unknown additives. Pharmaceutical grade vitamins also yield a higher degree of bioavailability – the rate at which a substance is absorbed into our bodies. What does this mean for you? Faster results, maximum health benefits, and no risky side effects. At BioAge MD, our clients love that all of our supplements are pharmaceutical grade. What are the most common supplements? Currently, some of the most popular nutrient supplements are multivitamins and vitamins B, C and D. Another is calcium which supports bone health, and vitamin D helps the body absorb calcium. Vitamin E is also a popular antioxidant that helps prevent cell damage. Folic acid, whether from supplements or fortified food, is important for all women of childbearing age and vitamin B12 keeps nerve and blood cells healthy. Many doctors also recommend fish oil supplements because research indicates that omega-3 fatty acids found in fish oil support long-term brain, bone, heart, and metabolism health. So now that you know a little more about supplements, where do you start? At BioAge MD, we have a wide range of pharmaceutical grade supplements and we welcome you to come in and speak with our knowledgeable medical staff about which supplements may be right for you. And lucky for you, you get 10% off your first purchase. Click here to shop our online supplement store. It’s not often that a seemingly magic potion comes around that promotes wellness. 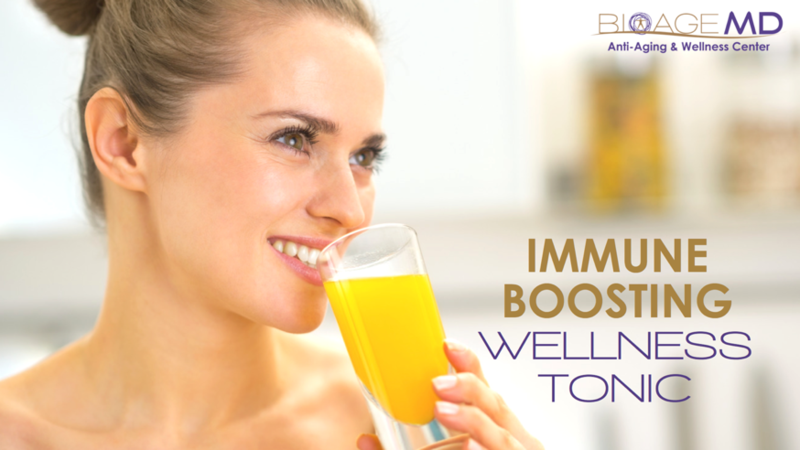 BioAge MD’s wellness tonic is just that. Wellness tonics, sometimes referred to as health tonics, herbal tonics, or immunity tonics contain vitamins and minerals which may help protect cells and kick the immune system into action. Sometimes made with adaptogenic herbs, BioAge MD’s wellness tonic is a combination of 13 well-known plant extracts. These immune-boosting liquids are derived from ancient healers and shamans who foraged for ingredients. Before pharmaceuticals and before big medicine, doctors were forced to use their surrounding environment to help heal the sick. Leaves, berries, mushrooms, herbs, and spices were all customized into elixirs for patients. In some areas of the world, these Ayurvedic principles are still used to treat the sick. BioAge MD’s wellness tonic includes ingredients like coconut, clove, cedar, and garlic. Ready to start sipping? Great! Just keep in mind that wellness tonics are not a quick fix. They are not intended to diagnose, treat, or cure any kind of illness or disease. Usually, tonics are sipped over time, and long-term use usually yields the best results. It is highly suggested that you consult a professional before ingesting any kind of new wellness tonic mixture. In some cases, suggestions for additional ingredients might be given based on your specific needs. It is also important to limit your wellness tonic intake. For BioAge MD’s wellness tonic, doctors indicate no more than 5-10ml once a day for preventative use and 10ml 3 times a day for acute use. Directions differ for children. Another great thing about wellness tonic is that it can be taken with water or juice. So, if the taste isn’t something you enjoy, it can certainly be masked. Wellness tonic should be stored in a cool, dry place or refrigerated after opening. It should not be taken if you are pregnant or nursing. These products should also be taken with a varied and balanced diet in conjunction with a healthy lifestyle. To learn more about BioAge MD’s wellness tonic, or other products and services, contact BioAge MD for a consultation in West Palm Beach today! Each and every day we are exposed to a long list of unwanted toxins that are stored in tissues and cells throughout the body. Toxins can be natural and manmade and are ingested through food, water and even through the air you breathe. Some of these toxins remain in the body for years. 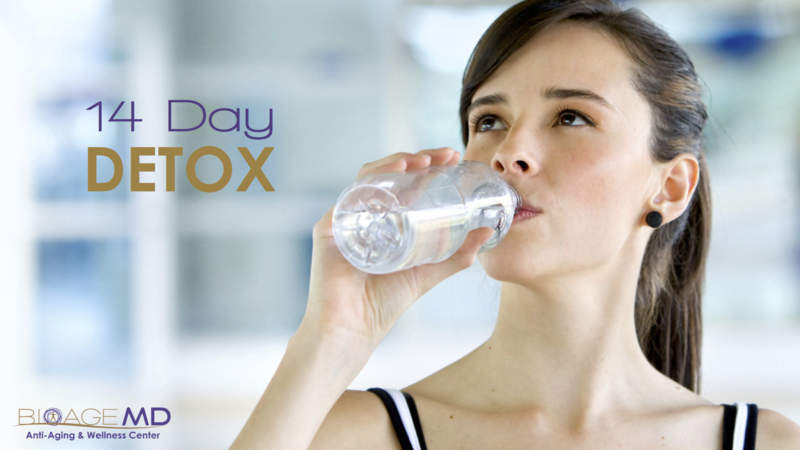 Detoxification is a type of alternative medicine that aims to rid the body of the aforementioned unwanted toxins. Detoxes come in the form of dieting, fasting, consuming or avoiding specific foods, cleanses, and even the removal of dental fillings. Detoxes have become so popular you may have even seen your favorite celebrity promoting their own choice of detox via social media. BioAge MD in West Palm Beach offers an advanced 14-day detox made of the highest quality nutraceuticals manufactured to meet a high degree of quality standards. BioAge MD’s 14 Day Detox Program is an extremely easy to follow, low-glycemic food elimination diet. The Glycemic Index (GI) is a ranking of carbohydrates in foods according to how they affect blood glucose levels. Carbohydrates that have a lower GI value are slower to digest and are absorbed and metabolized, causing a lower and slower rise in blood glucose. The targeted nutrition in this particular detox is provided via two daily shakes and four capsules aimed at enhancing the activities of hepatic detoxification enzymes. Hepatic is anything relating to the liver. The great thing about this particular detox is that it really targets the whole-body. It has a great taste and doesn’t interrupt your daily routine like other, more invasive detoxification programs. This program also walks you through what is needed to get started including what to add to your shopping list, sample menus and lifestyle tips to help maintain a healthy lifestyle throughout and after the detox. Ideal Protein is a medically developed, supervised, ketogenic weight loss and weight management protocol. Simply put, Ideal Protein is a four-phased approach that contains two key components. There’s the weight loss component, along with the often neglected lifestyle education component that empowers the client to sustain the weight loss results over time. Ketogenic is a fancy term for a diet that is protein based with low carbohydrate intake that forces the body to burn fat instead of it’s preferred source of fuel – carbohydrates. While four phases might sound overwhelming, Ideal Protein is organized in a seamless way that is easy to follow. In many cases, phases overlap since many of the phases include an educational element. Phase 1 focuses on achieving 100% of the client’s weight loss results via the ketogenic diet. Weight loss can be difficult, and for many people across the world it is a struggle of trial and error. Since the ketogenic diet was medically developed based on how the body internally operates, results are often realized faster than expected. Phase 2 places a spotlight on the fundamentals of food and how different types of foods actually impact your body. Knowledge truly is power. Phase 3 emphasizes ways to develop smarter eating habits and ways to create a better lifestyle. Since the goal of most weight loss journeys is to maintain the weight loss, Phase 4 highlights how to maintain the idea weight achieved in Phase 1! The Ideal Protein diet is supplemented with partial meal replacements. One of the most unique parts of Ideal Protein that really sets it apart from other weight loss regimens and companies is the one-on-one coaching that each client gets throughout the weight loss journey. To enhance the experience, there are online tools and ongoing sources of support that help to maximize the success of each individual. Quite possibly the best part of Ideal Protein is that the program is affordable. The food is easy to prepare and, yes, even delicious! 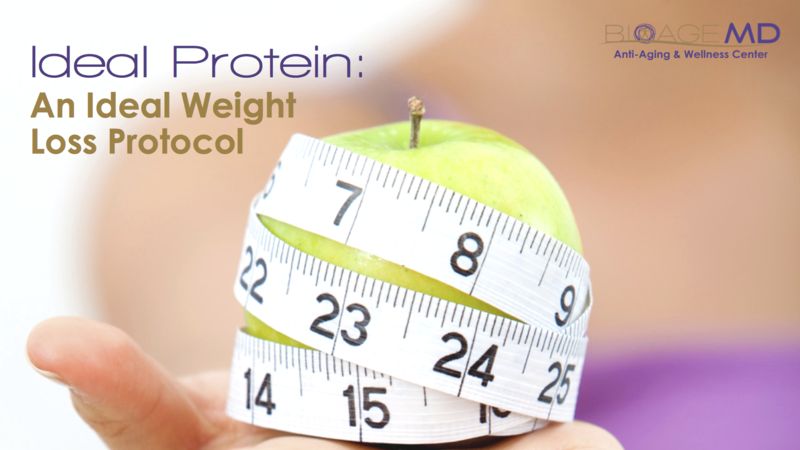 Ideal Protein is about much more than just losing weight. It is about how to lose it and how to keep it off. One of the easiest ways to commit to losing weight is to incorporate new, healthier habits into your everyday life. Ideal Protein does just that. BioAge MD has a direct partnership with Ideal Protein to help people achieve their weight loss goals while maintaining a healthy lifestyle. Give us a call at (561) 223-2707 to set up an appointment and get your weight loss plan started TODAY! NAD+, or nicotinamide adenine dinucleotide, has been coined the ultimate solution for brain restoration. But what is it? Every now and again it seems as if something new enters the market that promises new beginnings or a resurgence of energy and clarity to our lives. Unfortunately, a lot of these promises are based on the idea of introducing something foreign to our bodies. NAD+ Therapy is different. NAD+ is essential to sustaining life. It’s a substance that actually occurs naturally in every cell of the body that is responsible for restoring things like energy and athletic performance. In metabolism, this coenzyme is involved in redox reactions, carrying electrons from one reaction to another. Sadly, NAD+ levels decline significantly with age. In fact, by age 50, we only have about half of the NAD+ we once had in our youth. By the age of 80, NAD+ levels decline to a staggering 1-10%. This deficiency can increase our risk of cardiovascular diseases, cancer, diabetes, neurodegenerative diseases, and a variety of other diseases. NAD+ Therapy actually helps repair DNA, which helps improve brain functions and aids in the treatment of neurological disorders that many elderly people begin to experience. The Society of Neurosciences have actually completed a few studies that prove the effects of NAD + IV Therapy and how successful it can be in helping an aging person through the aforementioned changes. Using NAD+, scientists have effectively reversed DNA aging in mice. “NAD+ is the closest we’ve gotten to a fountain of youth,” says David Sinclair of Harvard Medical School. “It’s one of the most important molecules for life to exist, and without it, you’re dead in 30 seconds.” Researchers have discovered that re-upping NAD+ in older mice causes them to look and act younger and live longer than expected. In a 2017 study, Sinclair and his colleagues put drops of a compound known to raise levels of NAD+ into the water for a group of mice. Within about 2 hours, the NAD+ levels in the mice had risen significantly. About a week later, signs of aging in the muscles and tissue of the older mice reversed to the point that researchers could no longer tell the difference between the tissues of a 2-year-old mouse and the tissues of a 4-month-old one. One of the best characteristics about this type of treatment is that it’s natural. This is something your body is already producing. BioAge MD offers high dose infusions of NAD+ that go directly into the bloodstream to repair cellular functions throughout the body. 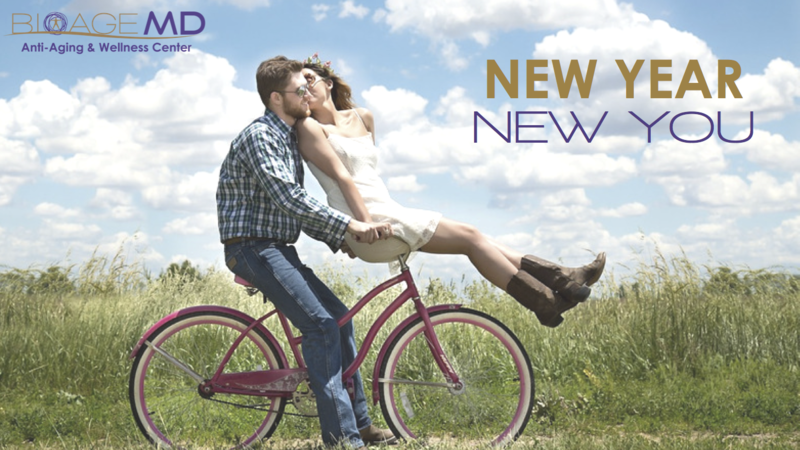 In addition to NAD+ IV Therapy, we also offer NAD+ sublingual supplements. We welcome you to schedule a consultation with our knowledgeable staff in West Palm Beach to see if NAD+ is right for you. Please call (561) 223-2707 or contact us on our website. 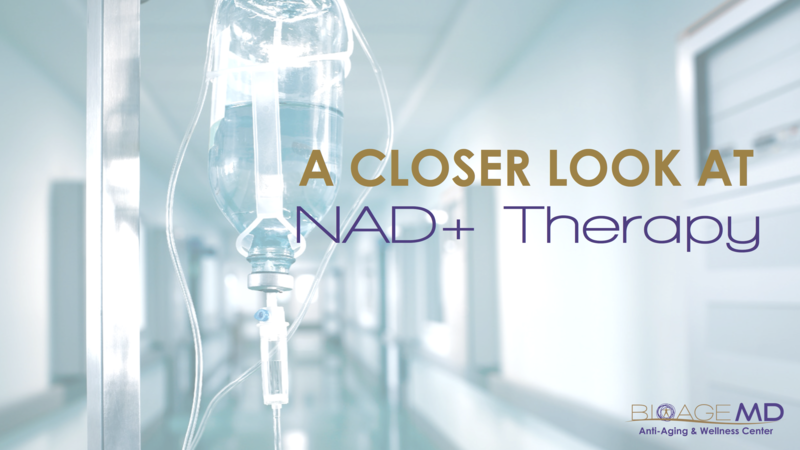 For more information about NAD+, click here! The HCG Weight Loss program is more than just fast acting, it helps actually curb appetite and enhance fat burning capabilities (in conjunction with maintaining a low-calorie diet). Still on the fence? Here’s all you need to know! This weight loss regimen has been around since 2010 and is actually named after the same hormone the body makes during pregnancy. HCG, or human chorionic gonadotropin, really acts as a way to reset the metabolism. The diet limits you to a specific amount of calories per day for a certain number of weeks in conjunction with an HCG injection, which you self-administer daily. The injections are even approved to treat fertility issues. Weight loss is a different type of journey for each person. Depending on your body and its chemistry, weight loss might be a struggle. This might be the best option for you. What Does BioAge MD Offer? In addition to offering HCG injections and a low-calorie diet, HCG participants also receive weekly fat-burning injections with their weigh-in and one-on-one weight loss support with one of our medical professionals. 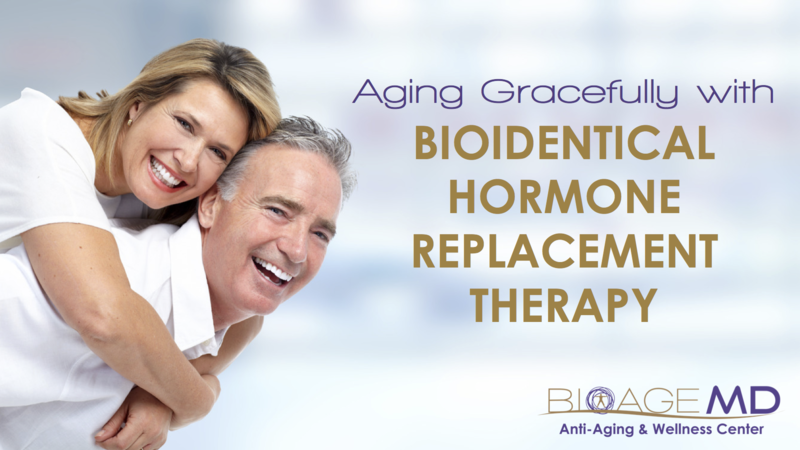 At BioAge MD, we offer two separate program lengths depending on the goals of the individual patient. If you think HCG injections might be right or your weight loss transformation, we invite you to schedule consultation with BioAge MD in West Palm Beach by calling (561) 223-2707 or contacting us on our website. We require a one-on-one consultation to adequately assess the individual goals of each patient and create a weight loss regimen that’s right for them. Bioidentical hormone replacement therapy is one of the lesser known bio-therapies, but one of the most important for aging individuals. Administered to maintain optimal hormone levels, bioidentical hormone replacement therapy helps alleviate symptoms of aging like low energy, difficulty sleeping, loss of libido and physical changes. As humans age, our hormone levels naturally start to decline. Hormones have a direct relationship to the chemistry of the body and, as expected, once the inner workings of the body begin to change there are noticeable differences. The primary goal of this natural hormone therapy is to maintain the body’s level of hormones in a more natural way than introducing synthetic, foreign substances to the body. Studies have actually shown there are some real long-term benefits to bioidentical hormone replacement therapy. For example, natural hormone optimization has helped reduce risks of things like heart disease, osteoporosis, and senility. Hormone imbalances can cause symptoms that make you physically, emotionally and mentally uncomfortable. There is no reason to live like that when there is a safe, natural way to adjust these feelings. Nothing is worse than not feeling like yourself. We welcome you to schedule an appointment at BioAge MD Anti-Aging & Wellness Center in West Palm Beach today for your free consultation. Call (561) 223-2707 or click here to contact us on our website. We’re located at 1000 N Olive Ave, West Palm Beach FL 33401.